COLUMBIA, Mo 9/12/15 (Beat Byte) -- Since a Columbia Heart Beat story August 8, an online fundraiser to defray legal costs in the precedent-setting case Wilson/MacMann vs. City of Columbia and city manager Michael Matthes has reached 20% of its $10,000 goal: over $2,000. The milestone is significant because citizen activists in Columbia have virtually no history raising money to support their causes or candidates. Instead, they rely on word-of-mouth, public speaking, door-to-door campaigning, and other inexpensive message-distributing alternatives. Those techniques only go so far, however, often hitting a buzz saw called "big money" when political campaigns involve developer or big business interests. Columbia's development community recently established a Super PAC called Foundation for Columbia's Future that easily raises tens of thousands of dollars to support pro-developer and pro-City Hall causes and candidates. To watchers of the long-running CVS controversy, it’s stunning how city officials moved mountains to permit the Opus Group’s downtown student apartments, forcing tax and ratepayers to pick up the tab for the 256 units' infrastructure (water, sewer, streets, cops, lights, stormwater, electricity, etc.) while grumbling about many of the same issues in repeatedly denying the new pharmacy. 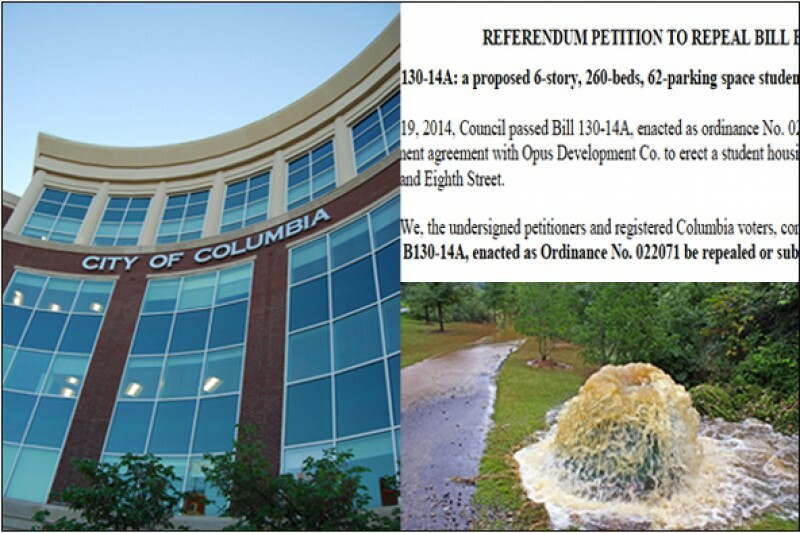 City officials permitted construction of the Opus student housing development even after citizens submitted two valid, certified petitions with over 5,000 signatures demanding repeal of ordinances approving the project. The approval circumvented the rule of law spelled out in both the City Charter – Columbia’s guiding constitution – and city ordinance governing petitions, sparking the lawsuit. Local attorneys Jeremy Root, Josh Oxenhandler, and Richard Reuben have taken the case pro-bono -- free of charge -- to Federal court. Funds raised will defray court fees, depositions, copying, and the myriad other costs that add up during litigation.